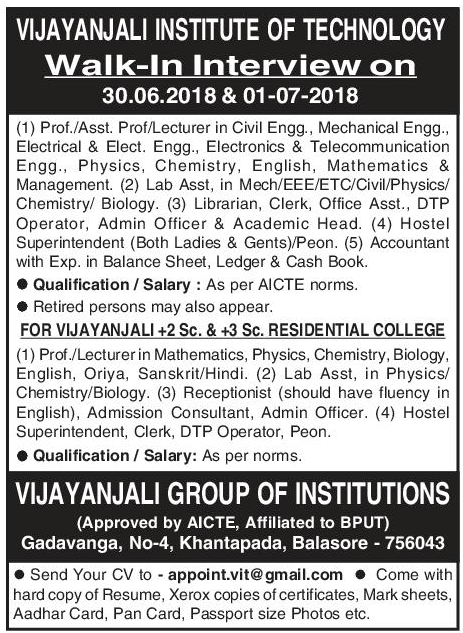 Vijayanjali Institute of Technology, Balasore has advertised in the SAMAJA newspaper for recruitment of Professor / Assistant Professor / Lecturers Plus Non-Faculty jobs vacancies. Interested and eligible job aspirants are requested to walk-in on 30th June 2018 & 01st July 2018. Check out further more details below. About College: Unique in its structure, plans & goals, Vijayanjali Institute of Technology (VIT) is established under agesis of Anjali Adarsha Educational Trust focused on the social & educational development of both State & Nation by providing quality technical education to the students. The institute spreads over 23 acres lush green campus on NH-5 just 12km from Balasore town. The 1,10,000 sqft built up area is dedicated to academic & administrative activity of the institute. How to Apply: Interested and eligible candidates are requested to attend the Walk-in interview along with CV, originals & copies of certificates, PAN card, Aadhaar card and recent PP size photo to the walk-in address. Before attending the interview send resume to the email address given below.